Every year at Adobe MAX, Adobe puts on an event called the MAX Sneaks where they show off technology that they’ve been working on that may or may not be available to users in the future. These Sneaks usually bring lots of oohs and ahhs from the audience. Adobe always has a well-known celebrity host the Sneaks, and past hosts have included big names such as Rainn Wilson and William Shatner. 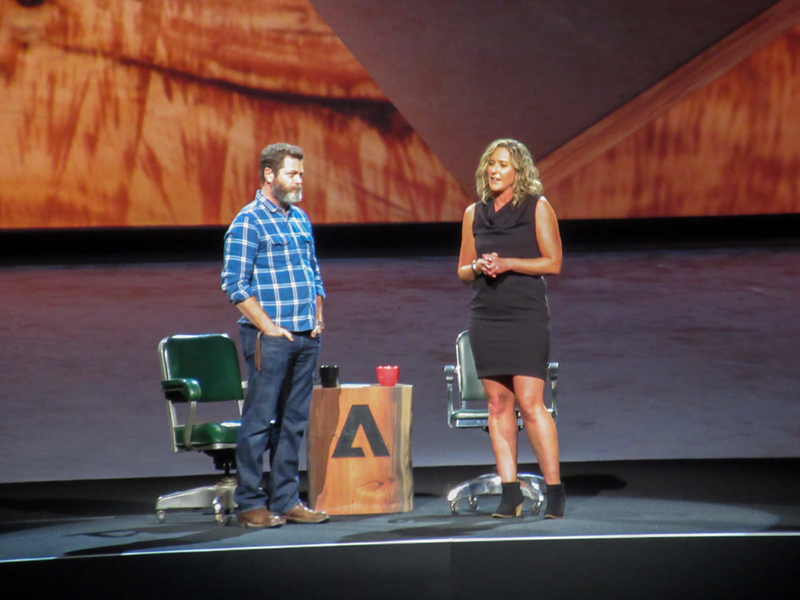 This year the show was hosted by Nick Offerman, best known for his role as Ron Swanson in Parks and Recreation, and co-hosted by Kim Chambers, community manager of Adobe’s experience design team. Offerman was absolutely hilarious and Chambers had to often remind him that the Sneaks was a family show. We’ll focus on a few highlights from the Sneaks that will be of interest to Photoshop users, both designers and photographers. First up was a preview of Louper by Bernard Kerr. With Louper, you can use images to search for other images. Just select the image that you want to use as the search criteria, and it will search for images with similar styles and composition. You can even use multiple images for the search, which will result in images that display a combination of those styles and compositions. Next was a preview of 3D Portraits by Nathan Carr. Carr imported a portrait of Offerman, had the application auto-detect his facial features (which Carr had to edit quite a bit), and then selected Offerman’s hair. He then identified Offerman’s neck and shoulder areas before hitting the Process button. In less than a minute, Offerman’s portrait transformed into a 3D model. 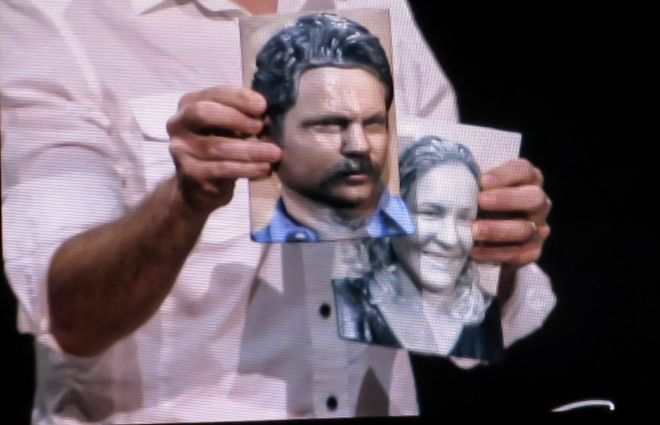 Carr imported the 3D model into Photoshop and then used the original portrait to replace the texture map to create a very realistic model of Offerman. Carr then presented 3D printings to both Chambers and Offerman that he had printed prior to the Sneaks. The next Sneak was Diffusing Photobombs by Eli Schechtman. This Sneak was all based on a simple slider. As you drag the slider to the right, distracting objects in an image are automatically deleted and filled in. The more you move the slider, the more objects it removes. Adobe had users identify common objects that they routinely remove from images. They used this list to develop an algorithm that would identify thousands of these objects and remove them using their Content-Aware Fill technology. It will even remove reflections in the glass of a picture frame. When Chambers asked Offerman what were some of the things that he would like to have removed in all the pictures that have been taking of him, he said those “pesky other people,” because when Chris Pratt is in an image with him, no one ever notices Offerman. The next presentation was by Hailin Jin and it was called DeepFont. With this technology, you can make a selection around a rasterized font in Photoshop and go to Type>Recognize Type. Photoshop will analyze the font and return several font options that it thinks are the closest match. Jin also demonstrated this using a font capture app on an iPad so when you’re out and about and you see a font you like, you can capture it with your iPad’s camera and then have the app identify it. There were several more Sneaks, but we’ll just focus on three more that are of interest to designers and photographers. The first was Project Faces presented by Lee Brimelow. 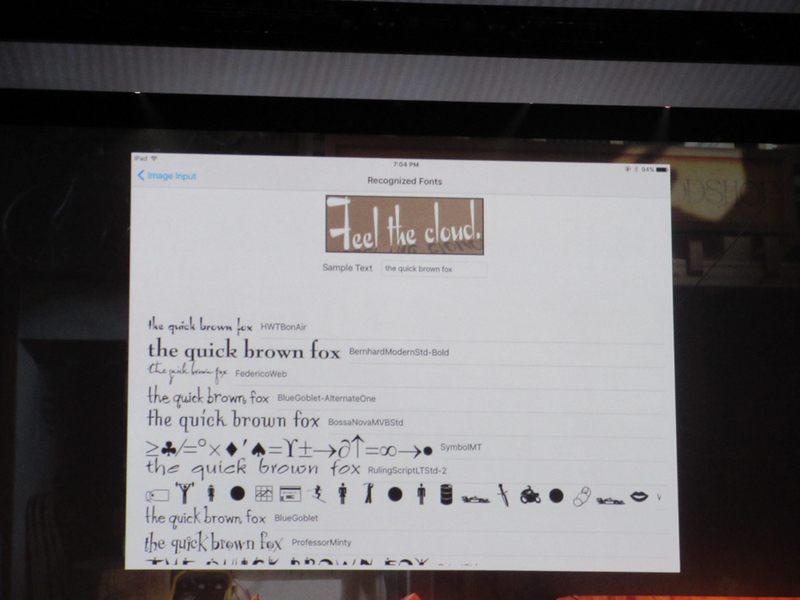 This is amazing technology that can customize any font into exactly what you need for your designs. There were sliders for changing the Weight, Crossbar, Width, Slant, Contrast, and Curves. You could even add or remove serifs, and add effects such as Centerline, Offset, Stencil, Flatten, and Jitter. The excitement was palpable from the designers in the audience. Next up was Extract Shading. This demo was by Kalyan Sunkavalli. In Photoshop, you can split the lighting and shading from texture and colors and edit them independently. In this example, Sunkavalli separated red letters on a white T-shirt from the light and shading in the image. He then easily removed one of the letters. He also showed how you could easily swap out wallpaper in a picture of a room and keep the lighting and shading intact so the image still looks natural and realistic. Finally, there was Monument Mode. This demo was by Ashutosh Jagdish Sharma. Sharma had Chambers and Offerman walk back and forth between a DSLR and the giant MAX logo on the stage. As they moved around in front of the camera pretending to be tourists, the camera analyzed the data and eventually removed them from the scene. This technology is designed to remove those “pesky other people” from your scenes while photographing popular tourist spots.